Hackers have attacked the website (www.valerie boyer.fr) of French parliamentarian Valerie Boyer, the author of the bill criminalizing genocide denial that was recently adopted by the French National Assembly. The hackers posted a Turkish flag and an address to the French government and the Armenians community of the country. 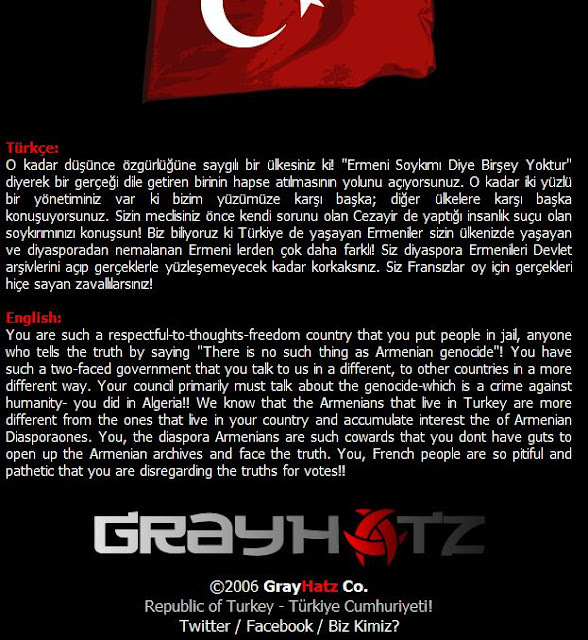 The message says that the bill was meant to reap votes in 2012 election.French National Assembly passed a bill criminalizing public denial of the Armenian Genocide. If passed and signed into law by the Senate, the bill would impose a 45,000 euro fine and a year in prison. Ms. Boyer said she called the police after she and her family members received death threats.On December 22, 2011, French National Assembly passed a bill criminalizing public denial of the Armenian Genocide. If passed and signed into law by the Senate, the bill would impose a 45,000 euro fine and a year in prison for anyone in France who denies this crime against humanity committed by the Ottoman Empire. Following the vote, Ankara recalled its ambassador from France.